October 3rd is always a bank holiday in Germany – the Day of German Unity. 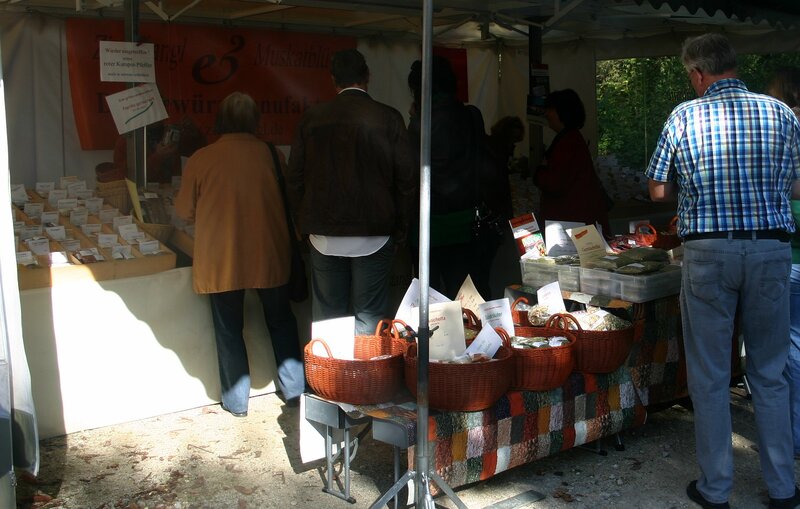 Every year my town has an autumn market on this day, which is dedicated to products only from the region. I love this idea, as even our farmer’s market sells imported fruit and vegetables, and I think it is important to try and buy locally produced goods when possible. It has become a tradition for my friend/neighbour and I to go and take a look. I think it has been going for about 4 years now, and gets better every year. And we always have beautiful weather! 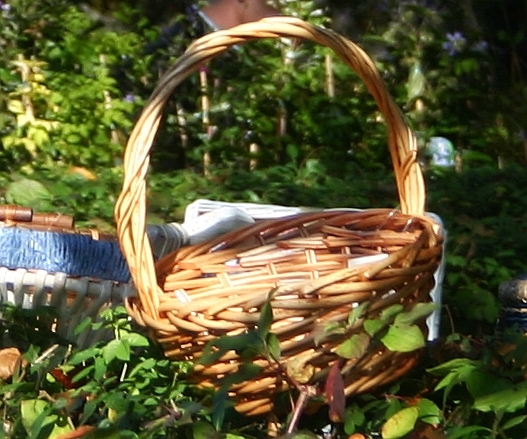 The setting is the beer garden of a local brewery, so for those who want refreshments there is of course beer, coffee, organic food and smoked fish on sale. Thanks to Elisabeth for coming with me every year! This entry was posted in Days, Food, Herbs & Spices, Nature, Plants, Traditions and tagged Autumn, Countryside, Environment, Food, Germany, Herbs, Holidays, Plants, Seasons, Spices, Traditions. Bookmark the permalink. That would be a fun place to go. I love open air markets. They are also a good place to take photos. Just look at yours! The October sunshine gives everything a glow – perfect for photos! I really enjoyed the atmosphere there… “small town coming to life”! LOL! Terrific pictures. Outdoor markets and festivals are so fun this time of year. Glad you found some items to bring home. Thank you Susie! I also bought a tiny bottle of hazelnut liqueur to test and it was so delicious! The squirrels have had all my hazelnuts this year though! 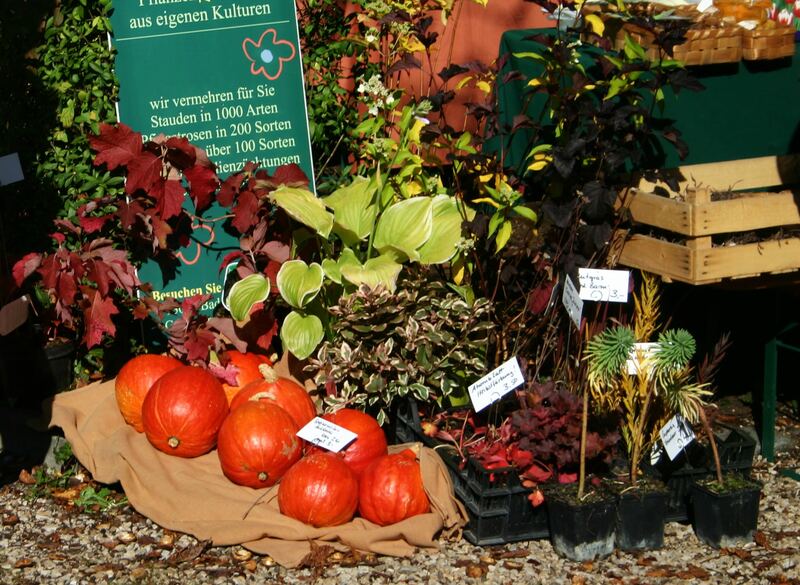 Aah, the colours of autumn as well as all the bounty of the summer gathered together to store for the winter. Lovely! And glad to hear you get a market close to home at least sometimes! Looks like a great day out! 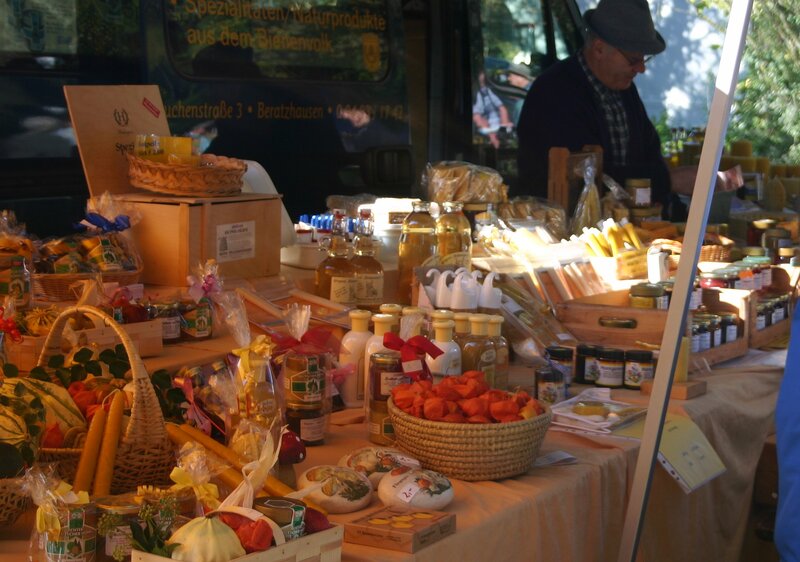 Markets like this are such a good way to discover local producers and growers. A shame it’s only once a year! Thank you Uta, we did! hours – as every year! Thanks to you too! It’s a nice end to the gardening season. And we’ve been so lucky with the weather! 😀 Especially when the sun shines! 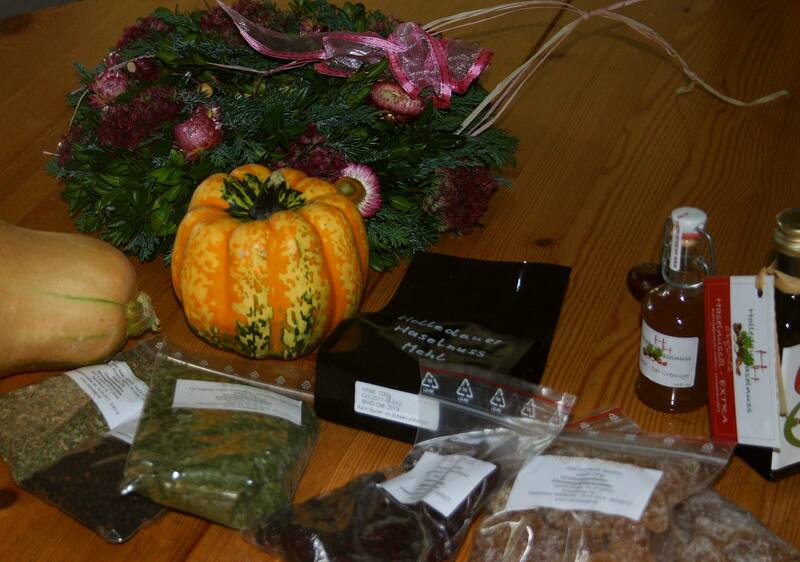 Thanks for taking me along to the harvest market and sharing your treasures. I wonder what the hazelnut flour will make…. I’m working on that Mountainmae! Any ideas welcome! 😉 Glad you enjoyed the market. What a great event and all those wonderful products and produce..we have an apple festival here as there are lots of apple growers and the trees are brilliant…unfortunately it is a dicey thing with weather…cold and rainy this year so it is more like a mud festival with tens of thousands coming from all over…too crowded now to go. It’s a matter of luck here too with the weather…. often we have a warm and sunny October, but with wet cooler days too! 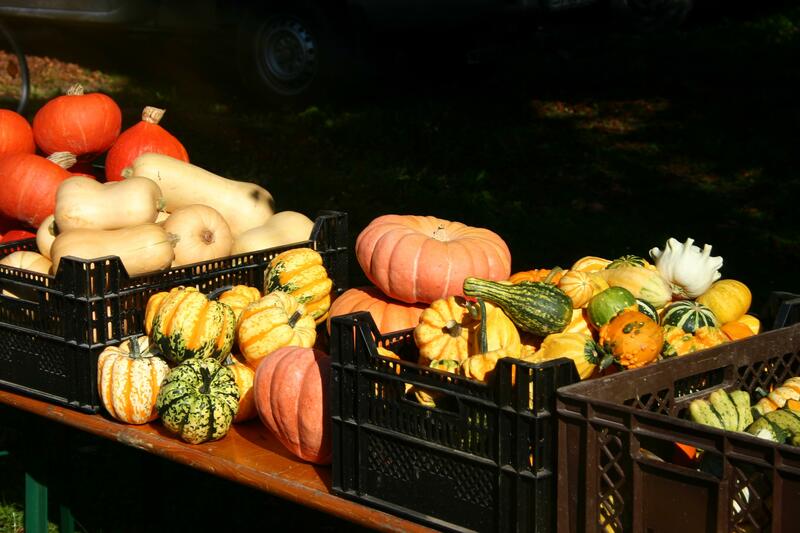 What a wonderful day out, fall vegetables are my favorites! Thanks for posting, helping me get in an autumn mood! 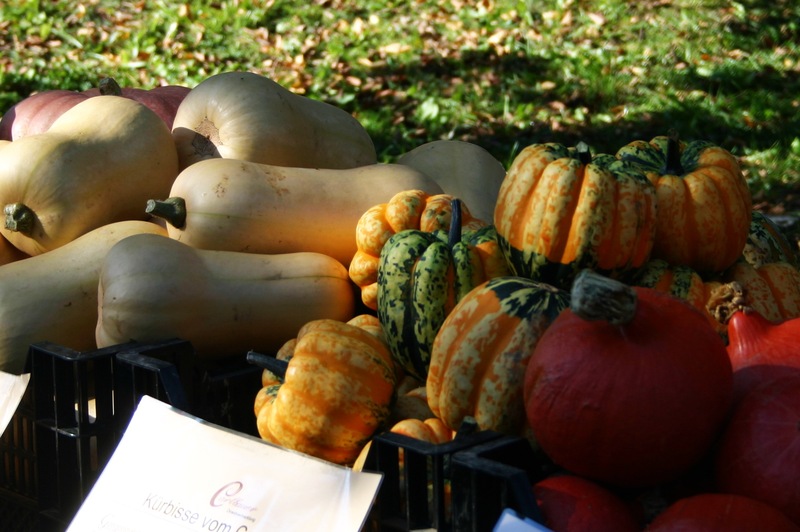 Those pumpkins really do “make” the atmosphere – so colourful and begging to be baked, pureed, filled etc!